has been providing design, installation and repair of electrical wiring projects, security systems and other integrated systems for residential and commercial projects since 1995. Whether you are looking for help with your home or your business, you deserve a professional with a commitment to customer service to perform the work in a safe and timely manner. Projects ranging from remodeling and renovations to custom estate homes with automated control systems and entertainment packages. Projects ranging from rigidly specified to custom design-build. Schools, retail and industrial building shells, tenant build out, nursing homes, dealerships, hotels and more. Systems that provide 24/7 monitoring of intrusion, smoke/fire, carbon monoxide, notification of your children arriving home, and more. Power Concepts, Inc. was founded in 1995 as an electrical contracting company. Since that time, we have expanded our available services to electronic security systems, intercom systems, automation systems, fire alarm systems, structured cabling packages and Audio/Video entertainment systems. We have successfully completed many jobs ranging from residential remodeling and renovation projects to custom estate homes with automated control systems and entertainment packages, as well as commercial projects including school gymnasiums, parking lot lighting, retail/industrial building shells, retail/industrial tenant build out, nursing homes, automotive dealerships, auditoriums, hotel renovations, substance abuse rehab centers, and much more. Our team has the training, experience and knowledge needed to complete your project on time and on budget. 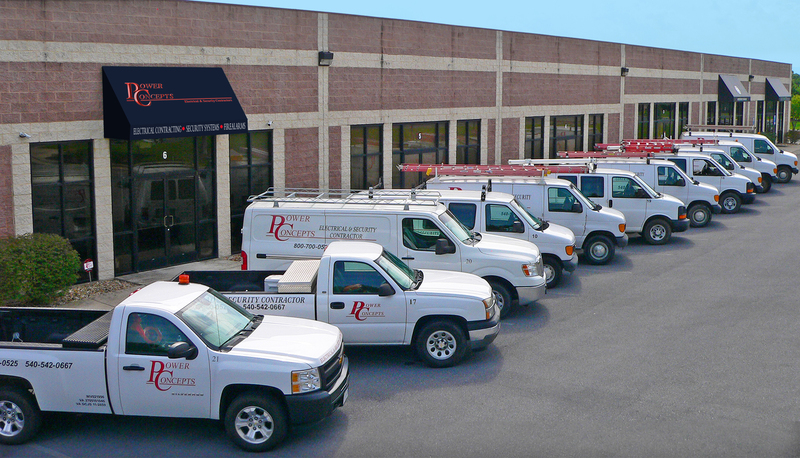 Our trained and experienced staff, including licensed electricians, estimators, project managers, and security technicians that are certified by the Virginia DCJS, would like the opportunity to add you to our list of satisfied clients. Power Concepts is fully licensed in West Virginia and Virginia as a Class A electrical contractor. Our company is also licensed with the Virginia Department of Criminal Justice Services for Electronic Security Services. We are a drug free work place and our employees in the field are required to have OSHA 10-Hour safety training. We carry comprehensive liability insurance and all required worker’s compensation coverage. Please contact us for any additional information or to schedule a meeting for any projects that we can help with… We are here when you need us.